NorthStarr’s Notes: The NorthStarr Classic 5 Panel hat series is similar to our last effort which was the “Everybody’s a Starr Series.” One decision that we made was to go with a slightly different cut 5 Panel biker hat. This hat stands a bit taller in front than the 5 panels with the leather patch. It’s in the vein of a traditional baseball cap but doesn’t stand as tall. It falls in the middle of the two examples. One feature that we definitely didn’t want to lose is the tuck away strap option in the back of the hat. 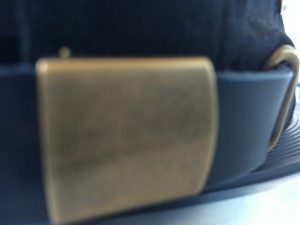 We find that some people don’t like the adjustable strap to poke out of the side of their hat however, others do thus this is a great amenity to keep. Front view of the hat’s height. Another differences is the type of materials used to make the NorthStarr Logo. For the last design we used leather. This time it’s vinyl. Thus the name ” NorthStarr Classic Vinyl 5 Panel hat series.” We stayed true to our color wave philosophy. When we release items that involve three colors or more we produce two of what we call safe colors and one that’s more daring. The more edgy color from the group is selected based on us deeming it to be aesthetically pleasing. In our last hat series, we released Black (with all tan leather), White, Navy Blue, Royal Blue and our “daring” color was Purple. This time we did White (Black Starr logo), Black, Navy Blue, and our wild card color is Turquoise (all white logos). 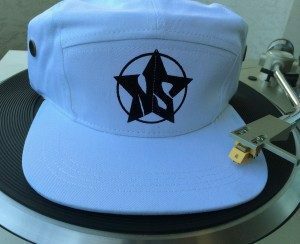 White NorthStarr Classic 5 panel Vinyl hat with white NorthStarr Logo (by NorthStarr Media Group). 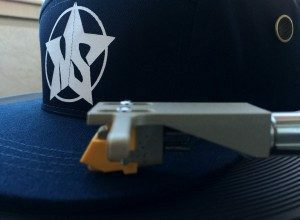 Navy Blue NorthStarr Classic 5 panel Vinyl hat with white NorthStarr Logo (by NorthStarr Media Group). Black NorthStarr Classic 5 panel Vinyl hat with white NorthStarr Logo (by NorthStarr Media Group). NorthStarr Classic Vinyl 5 panel hats can be purchased at our STARR STORE.